Someone asked me what sort of stuff i’ve programmed down my history. I don’t think i’ve ever documented it in one place, so i’m going the attempt a short summary here. I even saw that car while it was still in R&D at British Leyland! There are lots of other smaller hacks, but to give a flavour of the more sizable efforts. The end result is why I keep technically adept, even though most roles I have these days are more managerial in nature, where the main asset attainable is to be able to suss BS from a long distance. JOSS Language Interpreter (A Level Project: PAL-III Assembler). This was my tutors University project, a simple language consisting of onto 5 commands. Wrote the syntax checker and associated interpreter. Didn’t even have a “run” command; you just did a J 0 (Jump to Line Zero) to set it in motion. Magic Square Solver (Focal-8). Managed to work out how to build a 4×4 magic square where every row, column, diagonals and centre four squares all added up to the same number. You could tap any number and it would work out the numbers for you and print it out. Paper Tape Spooler (Basic Plus on RSTS/E). My first job at Digital (as trainee programmer) was running off the paper tape diagnostics my division shipped out with custom-built hardware options. At the time, paper tape was the universal data transfer medium for PDP-8 and PDP-11 computers. My code spooled multiple copies out, restarting from the beginning of the current copy automatically if the drive ran out of paper tape mid-way through. My code permitted the operator to input a message, which was printed out in 8×7 dot letter shapes using the 8 hole punch at the front of each tape – so the field service engineer could readily know what was on the tape. Wirewrap Optimiser (Fortran-11 on RSX-11M). At the time my division of DEC was building custom circuit boards for customers to use on their PDP-8 and PDP-11 computers, extensive use was made of wire-wrapped backplanes into which the boards plugged into the associated OmniBus, UniBus or Q-Bus electronics. The Wirewrap program was adapted from a piece of public domain code to tell the operator (holding a wirewrap gun) which pins on a backplane to wire together and in what sequence. This was to nominally minimise the number of connections needed, and to make the end result as maintainable as possible (to avoid having too many layers of wires to unpick if a mistake was made during the build). Budgeting Suite (Basic Plus on RSTS/E). Before we knew of this thing called a Spreadsheet (it was a year after Visicalc had first appeared on the Apple ][), I coded up a budget model for my division of DEC in Basic Plus. It was used to model the business as it migrated from doing individual custom hardware and software projects into one where we looked to routinely resell what we’d engineered to other customers. Used extensively by the Divisional board director that year to produce his budget. Diagnostics (Far too many to mention, predominantly Macro-11 with the occasional piece of PAL-III PDP-8 Assembler, standalone code or adapted to run under DEC-X/11). After two years of pushing bits to device registers, and ensuring other bits changed in sync, it became a bit routine and I needed to get out. I needed to talk to customers … which I did on my next assignment, and then escaped to Digital Bristol. VT31 Light Pen Driver in Macro-11 on RSX-11M. The VT31 was a bit mapped display and you could address every pixel on it individually. The guy who wrote the diagnostic code (Bob Grindley) managed to get it to draw circles using just increment and decrement instructions – no sign of any trig functions anywhere – which I thought was insanely neat. So neat, I got him to write it up on a flowchart which I still have in my files to this day. That apart, one of our OEM customers needed to fire actions off if someone pressed the pen button when the pen was pointing at a location somewhere on the screen. My RSX-11M driver responded to a $QIO request to feed back the button press event and the screen location it was pointing at when that occured, either directly, or handled as an Asynchronous System Trap (AST in PDP-11 parlance). Did the job, I think used in some aerospace radar related application. Kongsberg Plotter Driver (Press Steel Fisher, Macro-11 on RSX-11M). Pressed Steel Fisher were the division of British Leyland in Cowley, Oxford who pressed the steel plates that made Austin and Morris branded car bodies. The Kongsberg Plotter drew full size stencils which were used to fabricate the car-size body panels; my code drove the pen on it from customers own code converted to run on a PDP-11. The main fascination personally was being walked through one workshop where a full size body of a yet announced car was sitting their complete. 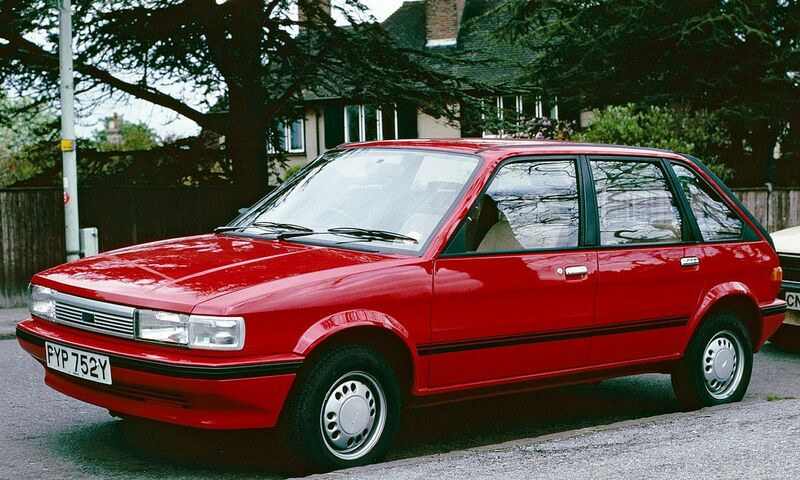 Called at that stage the LCP5, it was released a year later under the name of an Austin Maestro – the mid range big brother to the now largely forgotten Mini Metro. VAX PC-11 Paper Tape Driver (Racal Redac, Thorn EMI Wookey Hole, others, Macro-32 on VAX/VMS). Someone from Educational Services had written a driver for the old PC11 8-hole Paper Tape Reader and Punch as an example driver. Unfortunately, if it ran out of paper tape when outputting the blank header or trailer (you had to leave enough blank tape either end to feed the reader properly), then the whole system crashed. Something of an inconvenience if it was supposed to be doing work for 100’s of other users at the same time. I cleaned up the code, fixed the bug and then added extra code to print a message on the header as i’d done earlier in my career. The result was used in several applications to drive printed circuit board, milling and other manufacturing machines which still used paper tape input at that stage. Stealth Tester, VAX/VMS Space Invaders (British Aerospace, VAX Fortran on VAX/VMS). Not an official project, but one of our contacts at British Aerospace in Filton requested help fixing a number of bugs in his lunchtime project – to implement space invaders to work on VAX/VMS for any user on an attached VT100 terminal. The team (David Foddy, Bob Haycocks and Maurice Wilden) nearly got outed when pouring over a listing when the branch manager (Peter Shelton) walked into the office unexpectedly, though he left seemingly impressed by his employees working so hard to fix a problem with VAX Fortran “for BAE”. Unfortunately, I was the weak link a few days later; the same manager walked into the Computer Room when I was testing the debugged version, but before they’d added the code to escape quickly if the operator tapped control-C on the keyboard. When he looked over my shoulder after seeing me frantically trying to abort something, he was greeted by the Space Invaders Superleague, complete with the pseudonyms of all the testers onboard. Top of that list being Flash Gordon’s Granny (aka Maurice Wilden) and two belonging to Bob Haycocks (Gloria Stitz and Norma Snockers). Fortunately, he saw the funny side! VMS TP Monitor Journal Restore (Birds Eye Walls, Macro-32 on VAX/VMS). We won an order to supply 17 VAX computers to Birds Eye Walls, nominally for their “Nixdorf Replacement Project”. The system was a TP Monitor that allowed hundreds of telesales agents to take orders for Birds Eye Frozen Peas, other Frozen goods and Walls Ice Cream from retailers – and play the results into their ERP system. I wrote the code that restored the databases from the database journal in the event of a system malfunction, hence minimising downtime. VMS TP Monitor Test Suite (Birds Eye Walls, Macro-32 and VAX Cobol on VAX/VMS). Having done the database restore code, I was asked to write some test programs to do regression tests on the system as we developed the TP Monitor. Helped it all ship on time and within budget. VMS Print Symbiont Job Logger (Birds Eye Walls, Macro-32 on VAX/VMS). One of the big scams on the previous system was the occasional double printing of a customer invoice, which doubled as a pick list for the frozen food delivery drivers. If such a thing happened inadvertently or on purpose, it was important to spot the duplicate printing and ensure the delivery driver only received one copy (otherwise they’d be likely to receive two identical pick lists, take away goods and then be tempted to lose one invoice copy; free goods). I had to modify the VMS Print Symbiont (the system print spooler) to add code to log each invoice or pick list printed – and for subsequent audit by other peoples code. Tape Cracking Utilities (36 Various Situations, Macro-32 on VAX/VMS). After moving into Presales, the usual case was to be handed some Fortran, Cobol or other code on an 800 or 1600bpi Magnetic Tape to port over and benchmark. I ended up being the district (3 offices) expert on reading all sorts of tapes from IBM, ICL and a myriad of other manufacturers systems I built a suite of analysis tools to help work out the data structures on them, and then other Macro-32 code to read the data and put them in a format usable on VAX/VMS systems. The customer code was normally pretty easy to get running and benchmarks timed after that. The usual party trick was to then put the source code through a tool called “PME”, that took the place of the source code debugger and sampled the PC (Program Counter) 50 times per second as the program ran. Once finished, an associated program output a graph showing where the users software was spending all its time; a quick tweak in a small subroutine amongst a mountain of code, and zap – the program ran even faster. PME was productised by author Bert Beander later on, the code becoming what was then known as VAX Performance and Coverage Analyzer – PCA. Sales Out Reporting System (Datatrieve on VAX/VMS). When drafted into look after our two industrial distributors, I wrote some code that consolidated all the weekly sales out reporting for our terminals and systems businesses (distributors down to resellers that bought through each) and mapped the sales onto the direct account team looking after each end user account that purchased the goods. They got credit for those sales as though they’d made the sales themselves, so they worked really effectively at opening the doors to the routine high volume but low order value fulfilment channels; the whole chain working together really effectively to maximise sales for the company. That allowed the End User Direct Account Teams to focus on the larger opportunities in their accounts. Bakery Recipe Costing System (GW-Basic on MS-DOS). My father started his own bakery in Tetbury, Gloucestershire, selling up his house in Reading to buy a large 5-storey building (including shopfront) at 21, Long Street there. He then took out sizable loans to pay for an oven, associated craft bakery equipment and shop fittings. I managed to take a lot of the weight off his shoulders when he was originally seeing lots of spend before any likely income, but projecting all his cashflows in a spreadsheet. I then wrote a large GW-Basic application (the listing was longer than our combined living and dining room floors at the time) to maintain all his recipes, including ingredient costs. He then ran the business with a cash float of circa 6% annual income. If it trended higher, then he banked the excess; if it trended lower, he input the latest ingredient costs into the model, which then recalculated the markups on all his finished goods to raise his shop prices. That code, running on a DEC Rainbow PC, lasted over 20 years – after which I recoded it in Excel. CoeliacPantry e-Commerce Site (Yolanda Cofectionery, predominantly PHP on Red Hat Linux 7.2). My wife and fathers business making bread and cakes for suffers of Coeliac Disease (allergy to the gluten found in wheat products). I built the whole shebang from scratch, learning Linux from a book, then running on a server in Rackshack (later EV1servers) datacentre in Texas, using Apache, MySQL and PHP. Bought Zend Studio to debug the code, and employed GPG to encode passwords and customer credit card details (latter maintained off the server). Over 300 sales transactions, no chargebacks until we had to close the business due to ill-health of our baker. Volume/Value Business Line Mapping (Computacenter, VBA for Excel, MS-Windows). My Volume Sales part of the UK Software Business was accountable for all sales of software products invoiced for amount under £100,000, or where the order was for a Microsoft SELECT license; one of my peers (and his team of Business Development Managers) focussed on Microsoft Enterprise Agreements or single orders of £100,000 or more. Simple piece of Visual Basic for Applications (VBA) code that classified a software sale based on these criteria, and attributed it to the correct unit. MongoDB Test Code (self training: Python on OS/X). I did a complete “MongoDB for Python Developers” course having never before used Python, but got to grips with it pretty quickly (it is a lovely language to learn). All my test code for the various exercises in the 6 week course were written in Python. For me, my main fascination was how MongoDB works by mapping it’s database file into the address space above it’s own code, so that the operating systems own paging mechanism does all the heavy lifting. That’s exactly how we implemented Virtual Files for the TP Monitor for Birds Eye Walls back in 1981-2. With that, i’ve come full circle. Software Enabled (WordPress Network): My latest hack – the Ubuntu Linux Server running Apache, MySQL, PHP and the WordPress Network that you are reading words from right now. It’s based on Digital Ocean servers in Amsterdam – and part of my learning exercise to implement systems using Public Cloud servers. Part of my current exercise trying to simplify the engagement of AWS, Google Cloud Services and more in Enterprise Accounts, just like we did for DECdirect Software way back when. But that’s for another day. ← So, how do Policing Statistics work?